Intended as a practical guide for decision analysts, this chapter provides an introduction to reasoning under great uncertainty. It seeks to incorporate standard methods of risk analysis in a broader argumentative framework by re-interpreting them as specific (consequentialist) arguments that may inform a policy debate—side by side along further (possibly non-consequentialist) arguments which standard economic analysis does not account for. The first part of the chapter reviews arguments that can be advanced in a policy debate despite deep uncertainty about policy outcomes, i.e. arguments which assume that uncertainties surrounding policy outcomes cannot be (probabilistically) quantified. 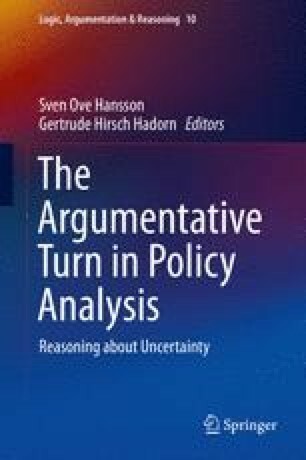 The second part of the chapter discusses the epistemic challenge of reasoning under great uncertainty, which consists in identifying all possible outcomes of the alternative policy options. It is argued that our possibilistic foreknowledge should be cast in nuanced terms and that future surprises—triggered by major flaws in one’s possibilistic outlook—should be anticipated in policy deliberation. Blaizot, J-P., Iliopoulos, J., Madsen, J., Ross, G. G., Sonderegger, P., Specht, H. J. (2003). Study of potentially dangerous events during heavy-ion collisions at the LHC: Report of the LHC Safety Study Group. https://cds.cern.ch/record/613175/files/CERN-2003-001.pdf. Accessed 12 Aug 2015. Briggs, R. (2014). Normative theories of rational choice: Expected utility. The Stanford Encyclopedia of Philosophy. http://plato.stanford.edu/entries/rationality-normative-utility/. Ellis, J., Giudice, G., Mangano, M., Tkachev, I., & Wiedemann, U. (2008). Review of the safety of LHC collisions. http://www.cern.ch/lsag/LSAG-Report.pdf. Accessed 10 Nov 2012. European Commission. (2011). Commission staff working paper. Impact assessment. accompanying the document communication from the commission to the council, the European Parliament, the European Economic and Social Committee and the Committee of the Regions. Energy Roadmap 2050. COM(2011)885. http://ec.europa.eu/smart-regulation/impact/ia_carried_out/docs/ia_2011/sec_2011_1565_en.pdf. Accessed 12 Aug 2015. Hartmut, G., Kokott, J., Kulessa, M., Luther, J., Nuscheler, F., Sauerborn, R., Schellnhuber, H-J., Schubert, R., & Schulze, E-D. (2003). World in transition: Towards sustainable energy systems. German Advisory Council on Global Change Flagship Report. http://www.wbgu.de/fileadmin/templates/dateien/veroeffentlichungen/hauptgutachten/jg2003/wbgu_jg2003_engl.pdf. Accessed 12 Aug 2015. Heal, G., & Millner, A. (2013). Uncertainty and decision in climate change economics. NBER working paper No. 18929. http://www.nber.org/papers/w18929.pdf. Accessed 12 Aug 2015. Schefczyk, M. (2016). Financial markets: The stabilisation task. In S. O. Hansson & G. Hirsch Hadorn (Eds. ), The argumentative turn in policy analysis. Reasoning about uncertainty (pp. 265–290). Cham: Springer. doi: 10.1007/978-3-319-30549-3_11. Shrader-Frechette, K. (2016). Uncertainty analysis, nuclear waste, and million-year predictions. In S. O. Hansson & G. Hirsch Hadorn (Eds. ), The argumentative turn in policy analysis. Reasoning about uncertainty (pp. 291–303). Cham: Springer. doi: 10.1007/978-3-319-30549-3_12.